And I mean that with a bold-faced period to follow. I'm 5'1", petite in frame, and I already look like a pre-pubescent boy about to spring up from immaturely tugging at girl's ponytails, to... well, another state of immaturity of tugging at their hearts. Scrubs drown me, I look like I'm an orphan wondering in the woods in pajamas looking for some parental figure to hold me. They make you blend in with everyone around you: no individuality, no personal statement of your physical space here on Earth, no personality! And not only that, but scrubs spat out at you from the hospital scrub scrub vending machine is way less rewarding than it's a counterpart: a bottled carbonated beverage. Why? Mainly because they smell like mothballs and stale food remains. I like to smell like lady garments, bouquets of flowers, and glistening rainforests of bokeh and colorful embers: you know, like the set of Sade's "By Your Side" music video. Alright, now that I've gotten my rant out of the way, you surely can more than accurately tell that: I HATE SCRUBS. With this assertion deeply ingrained in my mind, and simply put: I made them my own. Once I did, I began to get countless questions how I was able to find my own style beneath these blankets of despair. Fear no more, the answer is below. First and foremost, I HATE that scrubs drown me, so I had to find some that had SOMEWHAT of a trace of a human figure. I invested in Blue Sky Scrubs, because I love the material, and the color selection. But I have to be honest, if I had to do it over again, I would go with another brand, one more form fitting and not likely to show my private back side and gain me immediate entrance into the Plumber's Association of America. However, that is my first recommendation: finding colorful, somewhat fitted, and no plumber crack. Secondly, I ALWAYS accessorize: And I don't mean in an understated manner, I ain't that kind of girl. I never leave my house to work without an embellished necklace and statement earrings. 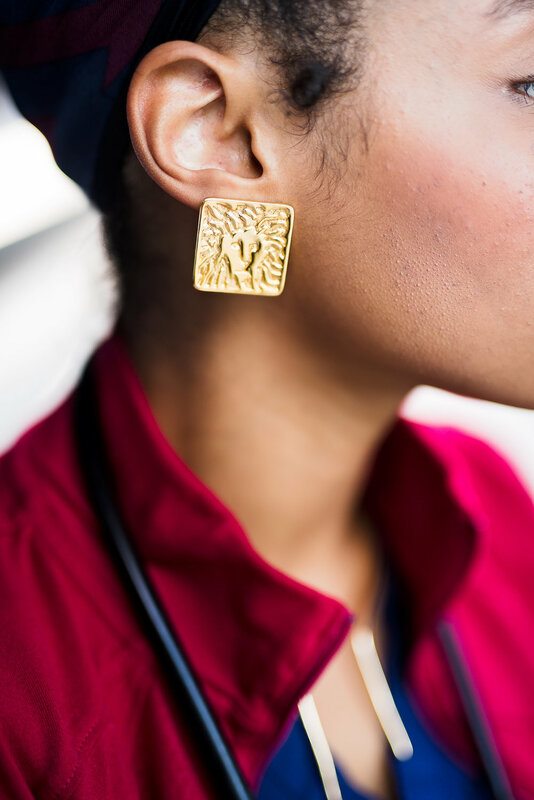 I love asymmetric and complexly designed pieces: I think it provides a sharp contrast to the symmetric, boring scrubs that it adorns. Of course, you can tailor this to your own, especially if you yourself are into more understated pieces. 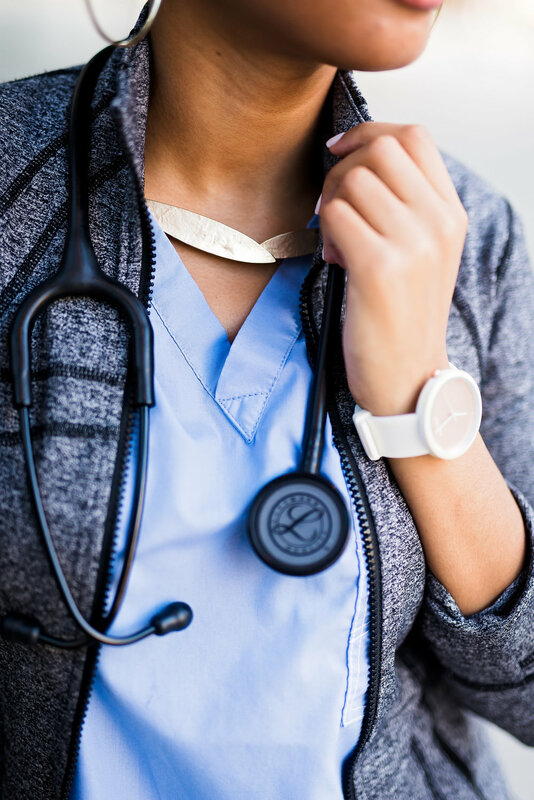 However, if you are going to do this, I would suggest making your scrubs stand out with a fun color, or having fun with your cover up, like your jacket/lab coat. I love a good embellished collar, and am generally always wearing one. I love this Nubian collar and earrings. I bought the necklace on clearance from BCBG and the earrings from Aldo. Not the most embellished necklace, but the asymmetry makes it a statement piece. I bought this on clearance from Chico's. Another played down, but statement necklace from BCBG, bought on clearance. Statement earrings from Ann Klein that I got from my mother. This brings me to my next point: don't forget about what's covering your scrubs! My coverup always provides another sharp contrast, like my jewelry I mentioned earlier. I always make sure it is form fitting and of the opposite color spectrum when styling day to day. Although they are stupidly priced, I love the Lu Lu Lemon jackets, (click here to see the exact jacket I wear), because they provide sizes small enough to fit my frame (I wasn't joking when I said I'm petite), and they are form fitting. Now I'm not trying to seduce anyone while I'm at work; however, I do believe in looking like a woman, and not the immature, pre-pubescent boy I referenced earlier. I also love shopping Target's jackets because they also have form fitting cover ups in a wide array of colors, so I can always find a color that offsets the scrubs I plan to wear. If wearing a lab coat is more your style, try dressing it up with brooches or have it tailored to your size. I'm telling you now, having your clothes more form fitting (not necessarily skin tight), makes your clothes and whole look general, more feminine. Notice how the white contrasts the pink. The deep red contrasts the blue. Lastly, I usually wear my hair in a brig fro if I don't have to worry about the OR for the day/week, in twists if I do (which this preoccupation is present most of the time, so I'm usually rocking twists). Click here to see how I style my twists in my natural hair. If it's a bad hair day: bun with a headband that has colors of the outfit I'm wearing. 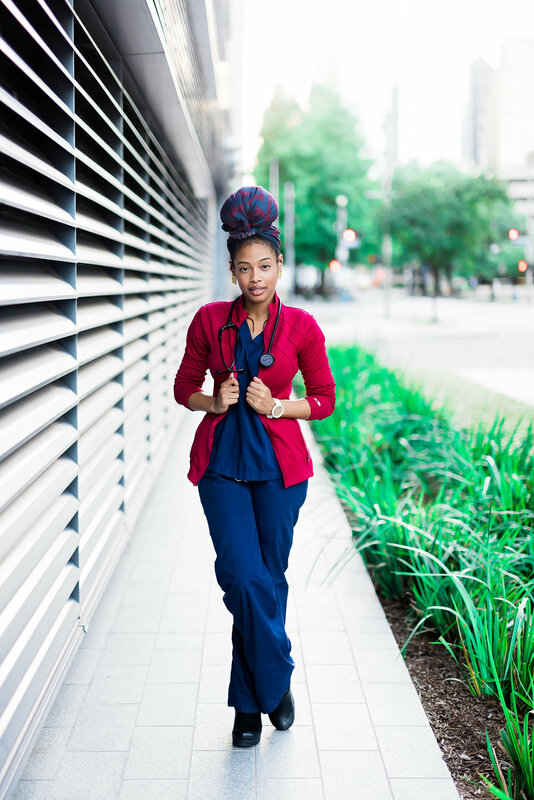 If it's a bad hair day and/or I need to deep condition in secret, I throw on a turbie twist and ensure that it matches the colors of my scrubs and cover up. Noticed how the I incorporated a pink and white scarf to match my pink scrubs and white jacket. Notice how the turbie twist has light blue and grey in it, like my scrubs and jacket. Headband has navy and burgundy in it, although you can't see it well. Turbie twist has navy and burgundy in it, purchased from The Limited. This tip will be the easiest one to complete in this article: DON'T be ___ from ___. Since the rest of my look is played up, I usually keep my wrist wear and nails very simple. I ALWAYS wear white nail polish, (I've only worn color on my hands ONCE in my life, no joke). It's a classic color, yet it keeps things put together. A simple watch to tone down my outfit, if any watch at all, is always a nice touch. 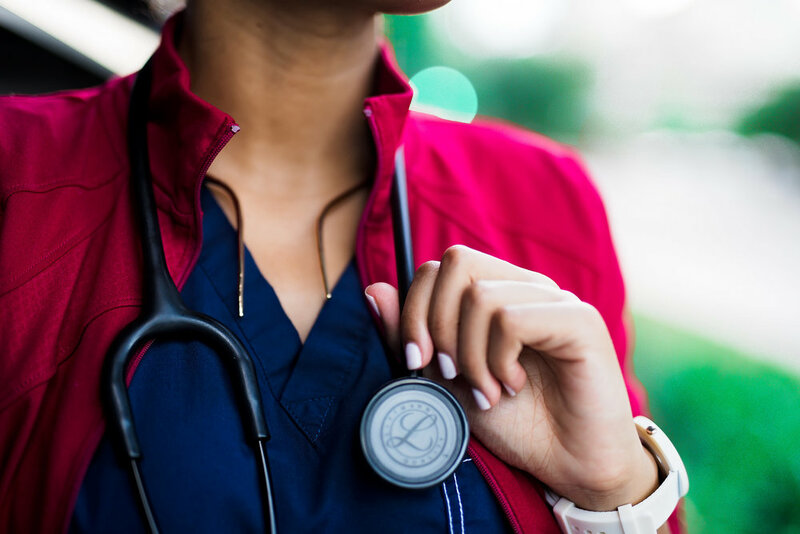 Anyways, I hope you found this blog post helpful and that you are ready to grace the halls of your hospital/clinic with fierceness!